There’s no bad time to charter in the British Virgin Islands. You’ll get your dose of sun, sea and breeze whatever time of year you visit. To me, though, the BVI are at their best around the end of March—just about when the Northeast, where I live, is emerging yawning and stretching from its blanket of winter snow. 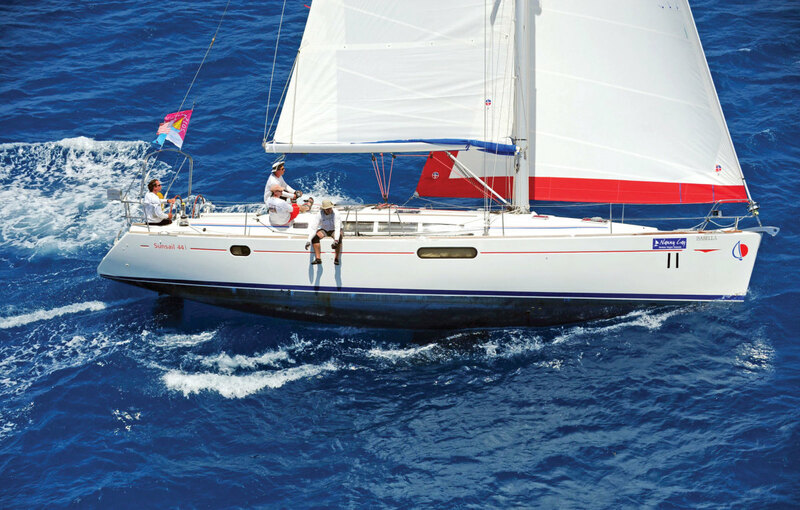 There is nothing that gets you in the mood for a new season’s sailing at home more than taking part in the BVI Spring Regatta. The BVISR isn’t just for high-ticket raceboats crewed by pros and semi-pros, though there are plenty of those around. ­It also has a thriving bareboat class, where everyday sailors can charter a boat for a week and indulge in some warm-weather racing around the islands. Bareboat racing can be as serious as you want it to be, or as relaxed. The serious guys pack light, run the boats with empty water tanks and scrub the bejasus out of the boat’s bottom. Under class rules you have to keep the anchor and chain aboard, and cannot modify the boat beyond removing the bimini and stowing it down below. You can de-rig your boat’s mainsail stack pack, but it has to remain attached to the boom. The crux of bareboat racing is to make your tubby cruiser, complete with (usually) tired sails, go faster than your rivals’ equally tubby boats. Boats are split into classes according to size, and races are run under a handicap system that, like all such systems, always seems to penalize whatever boat you’re on. Knowledgeable bareboat racers tend to book boats that are known to be fast, or ones numerous enough to be given a class of their own. One of the best things about bareboat racing is that it’s a truly international affair. We’ve had knock-down-drag-out battles with crews from the Netherlands, Russia, the Ukraine, Germany and Puerto Rico, as well as fellow Americans. Some we’ve lost, others we’ve won; either way we’ve had a hell of a lot of fun. Last March, our crew, Team Merlin, won all our eight races in the regatta and the sailing festival that preceded it on a Sunsail Jeanneau 44i. These have long been the preferred weapons of the serious bareboat racers; they have their own one-design class at the Heineken regatta in St. Maarten that precedes the BVISR. The Moorings 43 class is another strong one. You can have fun, and a chance at the podium, on just about any boat if you sail it well, though. Not all charter companies will let you race their boats, for obvious reasons. However, boat-on-boat collisions are rare, thanks perhaps to the requirement for a hefty damage waiver deposit. SAIL has campaigned boats from Sunsail, the Moorings and Marinemax; check with your preferred company to see if they’ll let you race their boats. The BVISR website (bvispringregatta.org) is another good resource. The Moorings has introduced the Beneteau Oceanis 38, winner of a SAIL Best Boats award, into its BVI fleet. The Moorings 38.2, as it’s known, provides spacious accommodations for two couples or a small family, combined with good sailing performance. You might get a deal on it in the Moorings New Year’s Eve Sale; go to moorings.com on January 4 to check out the specials.